AUSPICIOUS: Indicating a happy outcome - The prospect for this project appears auspicious. Synonyms: propitious, fortunate. Antonyms: ominous, foreboding. Synonyms: veritable, bona fide. 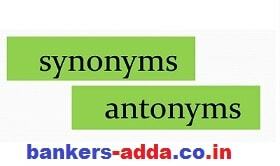 Antonyms: apocryphal, counterfeit, spurious, bogus. AUTOCRATIC: Despotic - feared by the masses as an autocratic ruler. AVARICE: Excessive greed - a fortune accumulated by avarice and miserliness. AWRY: Unsymmetrical; not straight - the picture, hanging awry on the wall. BANAL: Lacking in freshness, originality, or vigor-bored by his banal remarks. Synonyms: commonplace, hackneyed, prosaic, trite, stereotyped, vapid. BANEFUL (noun: BANE: poison; source of harm): Destructive, poisonous - a baneful effect, causing serious injury. Synonyms: deleterious, pernicious, virulent, noxious, toxic. BANTER: Good-natured teasing or ridicule-The two wits I exchanged banter, to the amusement of the audience. BATON: A stick or staff - The conductor wielded his baton gracefully. BELIE: To give a false idea of - His gracious manner belled his evil purpose. BELLICOSE: Inclined to quarrel; warlike - His bellicose attitude often got John into fights. BELLIGERENT: Engaged in war - two belligerent nations warring fiercely. BENEVOLENT: Kindly; charitable - like a benevolent monarch, bestowing many favors. Synonyms: benign, benignant, gracious, magnanimous. BEREAVE: To deprive or leave desolate by loss - a widow just bereaved of her husband. BESMIRCH: To soil or dirty - besmirched his opponent's good name with vile epithets. Synonyms: stilly, defile, smirch, bespatter. Synonyms: bigoted, arbitrary, partial, partisan. BIBLIOPHILE: A lover of books - The bibliophile fingered the old book fondly. Synonyms: odd, fantastic, grotesque, eccentric.